Do you enjoy the sound of running water? If you could have a waterfall, a bubbling brook, or a pleasant pond in your back yard; would it interest you? If so, we would like to turn your dreams into reality. TBI Unlimited, LLC designs and installs quality, long lasting, environmentally friendly aquatic features. The first thing to consider is the original inspiration for the pond or aquatic feature. Many times people see a stream or pond in nature that sparks their interest and they want their personal aquatic feature to reflect this. Using any ideas from nature will help to create a truly unique and authentic-looking aquatic feature. When designing your aquatic feature, don’t forget what inspired your decision in the first place. With this said, TBI has the knowledge and experience in building unique, and people friendly aquatic features. 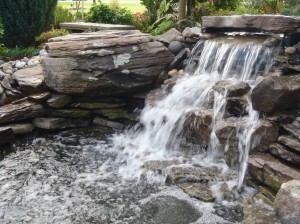 Weather you desire a waterfall that flows downstream to a well lit pond, or a small waterfall in the corner of your garden, we will help you achieve your goals. Our company currently designs and installs designs of all sizes. Weather you wish to watch the fish or swim with them TBI will design your Aquatic feature to meet alspecific needs.